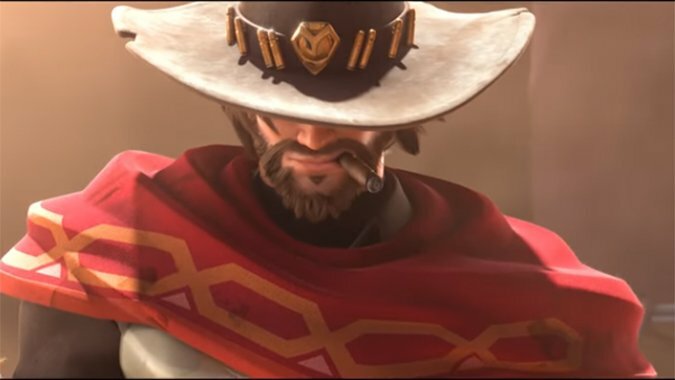 During the BlizzCon 2018 opening ceremony, Blizzard gave us the gift of an Overwatch McCree animated short that takes place on Route 66, titled “Reunion”. In it, we hear the Deadlock Gang blow up the bridge that you can see on the in-game map today. McCree exits the cafe and meets the crew along with what looks like one of their leaders, Caledonia “Calamity” Ashe. McCree confronts the gang — made up of both Omnics and humans — as they attempt to steal weapons and a large device of some sort. But it’s not a device or a bomb at all, it’s a slender Omnic that seems to know McCree. The entire short is full of great music and a big standoff and fight between McCree and the gang. We see Ashe use her rifle, sawed-off shotgun, and her sign-toting partner Bob — three things Overwatch players will definitely get used to as she is our new hero as well. What follows after the battle is McCree meeting up with a human-faced Omnic named Echo, who we know nothing about other than that they have been around before and used to run with our favorite cowboy. They seem to have no idea how long they’ve been in what is presumably some sort of dormant state and McCree looks very happy to see them. The short is beautiful as usual and also brings up a lot of questions about why McCree wanted to reunite with Echo so badly, especially since going back to his old gang doesn’t seem like the smartest idea if he wants to lay low post-Overwatch. Hopefully with the addition of Ashe as a new hero, her voice lines will reveal some juicy lore that will explain more of the context around the short. Hopefully we won’t have to wait long, I need to know more!